I'm not an avid runner and despite my utmost respect for those who are, I personally don't aspire to join the club. I don't have the attention span or the knees for it, plus, treadmills make me feel like time is moving backwards and I'm way too much of a wimp to run when it's really cold out. Now that I think about it, however, I could tell much of the story of my life just by reflecting on time that I've spent running. For instance, I could write about running around my grandparents' basement with my siblings and my cousins; how much I loved the sound of the adults talking and laughing upstairs, how gleefully terrified I was that someone would jump out of a dark closet at me, and how sad I was when that precious time ended every summer. I could write about field day as an elementary school kid -- that strange feeling I felt in my stomach whenever I thought about my gym teacher yelling out, On your mark, get set, go, and how I finally understood that feeling to be nervousness. I could write about playing basketball and the smell of my high school gym; about warming up before a game and feeling like I was ready to play whenever my parents walked in and took their seats on the bleachers. And then there was my favorite event in gymnastics -- the vault. The vault made me feel like I could fly and I still (literally) dream about sprinting down the runway and soaring through the air, twisting and flipping, and sticking the landing. I wake up feeling so magically close to the days when I could do that and it's always a bit disappointing to remember that now, I can't. I could also write about running in Maine during my first year of college; the miles upon miserable miles, because I thought I was fat and I had to burn off a certain number of calories before I'd let myself stop. I could write about how Brian helped me change all that; and how we started running together every now and then. Then there was running when I was a student in South Africa; the first time I learned the importance of always paying attention to my surroundings. In those five months, I did as the University of Cape Town orientation people had said to do, and I ran with a car key stuck between my right index- and middle-finger. As if that was going to stop someone who wanted to harm me from doing so. I could write about living with my grandmother the summer after I graduated from Bowdoin; running the hills near her house, and how much I loved to jog to the ocean and dive right in; how good my hot skin felt in the cold salt water. Speaking of jumping into cold water, I could write about when I started law school in the evening program at Suffolk. For those four years, I ran to class almost every single day. I remember one run in particular; through the freezing, pouring rain with a bag that must have weighed 40 pounds bouncing against my back. I remember thinking about how much I wanted to quit law school; that going to class at night after teaching all day was just too damn hard. I remember that night so clearly -- I got to class, dried off, and kept going. Running has also been a huge part of my work schedule as a lawyer. When I was at Ropes, I'd sprint to almost every morning train after dropping Teddy, and then Teddy and Annabel off at day care. Then I'd sprint back to the station every night. I didn't realize how much I hated that routine until I got to a place where a brisk walk will do. I love those walks now. I start to write on those walks. 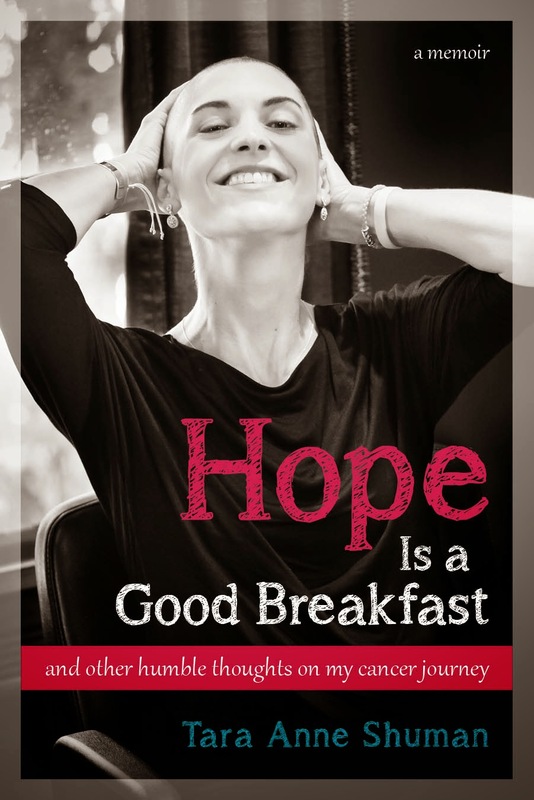 When it came to cancer, I started to run to prove to myself that the Herceptin was not giving me congestive heart failure. Unfortunately, it does that to some women, and before my first post-Herceptin echocardiogram, I was terrified that it had done that to me. So far, it hasn't, although I'm thankful that every three months, my doctors check again to be sure. Gradually, as I started to trust my heart more and more, I started to think about it less and less. I still sporadically think about my heart when I run, but when I do, I'm not scared that it will fail me. I'm just so deeply thankful that it has stayed so strong, and that it has received the Herceptin like the precious gift that it is. A few months ago, a fabulous local organization, We Beat Cancer, sent around an email that there were a few more numbers available for the 2013 Falmouth Road Race. Brian and I have talked about running that race for about 10 years now, and this year, we jumped at the opportunity. I hate asking people for money, especially when I'm asking the people who have already given us so much. But after I watched the video, I didn't mind telling people about this opportunity to donate. Proving once again the generosity of our family and friends, we collected more money than we ever could have imagined. This morning, however, it was time to do the work that we had promised we would do. Seven and one-tenth miles (yes, the 0.1 seems important to this bunch), on one of the most beautiful summer days I have ever seen. I had a personal goal for the race; a simple one that I revealed to Brian somewhere around mile four when I realized it was actually attainable. I wanted to feel strong through the whole run. If I had to slow down or walk, fine. I just wanted to feel strong. And, to my sincere surprise, through all seven miles, I did. In fact, Brian and I gained speed as the race went on. It was a truly incredible experience. This blog, however, is not about how today's run was symbolic of my cancer journey. I won't draw any silly analogies between our last (and fastest mile) to my chemotherapy or my mental state through cancer. I wish it were all that simple. But I know now that it's not. This past Friday night reminded me of that. Around midnight, after a fire alarm at the hotel we were staying at trashed the hour it took us to get the kids to sleep, I found myself in a very bad place. Teddy had stopped crying, Annabel had stopped jumping on the bed, and both of them were done telling us that the alarm was too loud (it was). Everyone fell asleep again, except for me. And that's when I felt cancer. Everywhere. I was achy, probably just from carrying Annabel around outside for 30 minutes as the Falmouth Fire Department sorted out the issue, or maybe from Teddy jumping off my shoulders in the pool earlier that day. But in my half-awake, half-asleep state, I was convinced that I felt cancer in my bones. If I had packed my Ativan, I'd have taken one, even if it meant that Brian would have had to shake me awake if the fire alarm sounded again. Ativan-less, I had to rely on my own faith that everything was going to be OK. Turns out that works too, and I fell into a deep sleep at some point around one in the morning, until 6:30AM when the fire alarm sounded again. The next day, we golfed in our annual family golf tournament. Being out there with my favorite guys -- my Dad, my brother, my husband, and my son; it was pure Heaven. When, after 18 holes, I felt great, I convinced the majority of myself (at least, for the time being) that my fears of the night prior were just the vomit of my sick imagination. 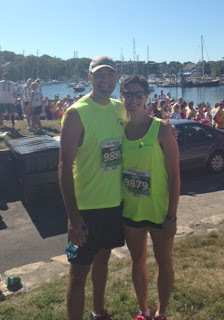 Today, exactly one year after I started this blog, we ran along the roads in Falmouth faster than we expected we could. After the race, we almost gave ourselves a pat on the back, but we were quickly brought back to reality when, on the two-mile hike back to the car, we both simultaneously tripped over a raised slab of concrete on the side walk. Tonight, I'm exhausted. Fulfilled, proud, increasingly sore, and totally exhausted. Tomorrow I'll start Part Two of this post. It will be about what the Falmouth Road Race really meant to me.